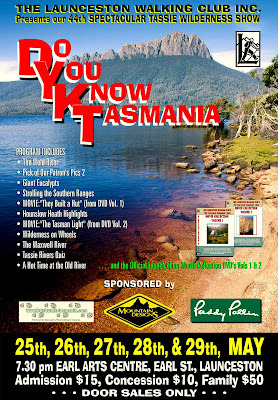 Do you know Tasmania? No? then find out! You are here: Home / Australian Trips / Do you know Tasmania? No? then find out! Want to get to know Tasmania? Would you like to walk in a beautiful rainforest? Stroll along a deserted ocean beach? Climb a rugged mountain peak? Camp beside a hidden tarn? Ski across a drift of newly fallen snow? Follow a meandering river through a misty gorge? Then the Launceston Walking Club could be for you and their 44th Spectacular Wilderness show is definitely worth attending. The show, on late this month, is a great way to see why we all love bushwalking in Tasmania. The main feature this year will be the official launch, by Senator Bob Brown (one of Our Hiking Blog’s national treasures) , of the first two DVD’s of the clubs 16mm movie collection. One movie from each DVD will be featured in the show. We can’t make it, but maybe you live in Tasmania or will be visiting Launceston between the 25th and 29th May. Feedback from this spectacular event has always been wonderful so please try and support the Club and enjoy their Multi Media Wilderness Extravaganza! Ian, from the Launceston Walking Club, is keen to present to show “on the mainland” in (possibly) November and we hope to arrange one in Geelong. Anyone who lives in the southern States and is keen to attend, or discuss with Ian the possibility of a show near you can contact us here by email. and we will forward your email.